Gardman R490 Woven Rope Hanging Basket. 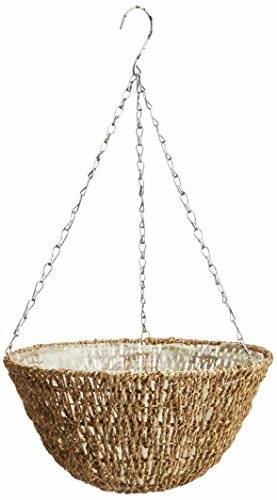 Attractive 14" diameter woven rope basket constructed of 100% natural fibers woven around a strong galvanized steel frame. Three heavy-duty galvanized steel chains with stainless steel "S" hook included for easy hanging. Arrives ready for planting; complete with pre-installed heavy gauge plastic liner for added water retention. The 8” depth provides excellent soil volume and a flat base assures tip-free bench filling. Suitable for use indoors or out: when used outdoors it is recommended that drainage holes be made in the plastic liner. Dimensions: 14” Long x 14" Wide x 8" High. Gardman "Bring your garden to life"